Planning your family trip to the beautiful Alabama Gulf Coast? Here are 10 of the best local family-friendly activities in Gulf Shores, Alabama and the surrounding area you won’t want to miss! 1. The Beach – If you are ready for swimming, sun bathing, snorkeling, or many other beach activities, you should not miss the Gulf Coast’s renowned sandy white beaches. There are no fees for beach access and parking is free at most of the public beaches. A list of all the public beaches can be found at gulfshores.com. 2. Alabama Gulf Coast Zoo – Home to more than 500 exotic animals, the zoo offers various education shows, daily keeper talks, and encounters with sloths, kangaroos and lemurs. The zoo is open daily from 9am-4pm, but be sure to call (251)968-5731 to ask about their current exhibits and show schedules. 3. Waterville USA – Don’t forget to pack your suits! 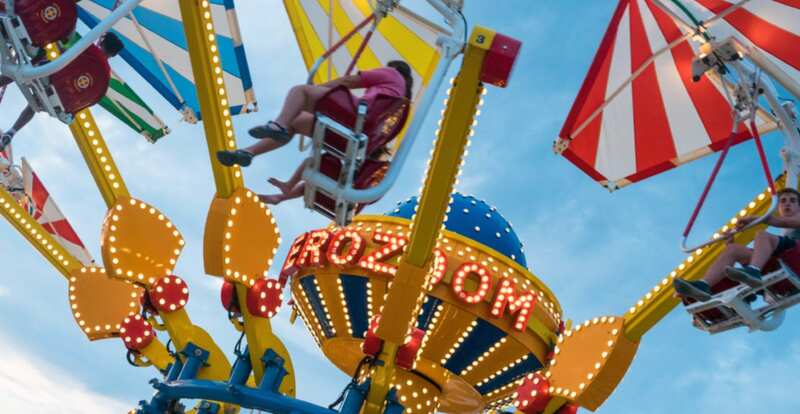 Known for its famous water rides such as the Flowrider, Triple Dog Dare, and Screamin’ Demon, this destination is a guaranteed success with the kids. There is also complimentary parking and cabana rentals for the parents. An open days and hours calendar is available on their website at WatervilleUSA.com. 4. Hangout Restaurant – Sip on a “Colossal Cocktail” while your daughter becomes the new Foosball champ. You can shop for souvenirs, chase the kids in the sand pit, and take a picture in the Giant Hangout Chairs to share with your family and friends back home. Be sure to order the golden fried Alabama Shrimp before you leave! 5. SPECTRA Light Show – Totally unique to the Gulf Coast, The Wharf’s Sound and Light Spectacular incorporates choreographed lighting effects with popular, surround sound music that is selected to engage audiences of all ages. The show starts at 6pm and 7pm and is FREE to the public. 6. The Track – Go-Karts! Do we need to say more? How about three and a half stories of go-kart track to suit your families need for speed. There is also miniature golf, an arcade, and other thrill rides for a guaranteed victory visit! The Track’s peak season runs from about May-August and the hours are Monday-Saturday from 9am-10pm. 7. OWA – Alabama’s newest amusement park is home to over 21 thrill rides and several restaurants including Wahlburgers. The hours vary daily but you can call (251)923-2111 for more information. Also, tickets are half off on Fridays from 4pm-9pm. 8. Gulf State Park Pier – Catch the big one on 2,448 feet of fishing space. The pier is the 2nd largest on the Gulf of Mexico and is 1,540 feet long. You can purchase tackle and souvenirs in the indoor retail area and have a seat at one of the comfort stations along the midpoint of the pier. The pier is open 24 hours, but the bait shop is open 6am until 6pm. 9. Orange Beach Marina – If your family is looking for some fun beach activities this place has you covered. They offer jet skiing, parasailing, and banana boat rides along with boat and yacht rentals and charters. Give them a call at (251)981-1800 for pricing and hours. 10. Fort Morgan – The wide variety of activities offered at Fort Morgan in Gulf Shores make it a great day trip for families. Enjoy a history lesson and beautiful nature walks at this historic site. Fort Morgan opens 8am-5pm daily. Please call (251)540-5257 for information on ticket prices. Many adventures are just waiting for you and your family at Gulf Shores, AL. We hope to see you soon!